get the best homes, at the best prices, from people who really care. scavenger hunts, nature hikes, pool games and handicrafts. TopVillas Ref: Reunion Resort 1. 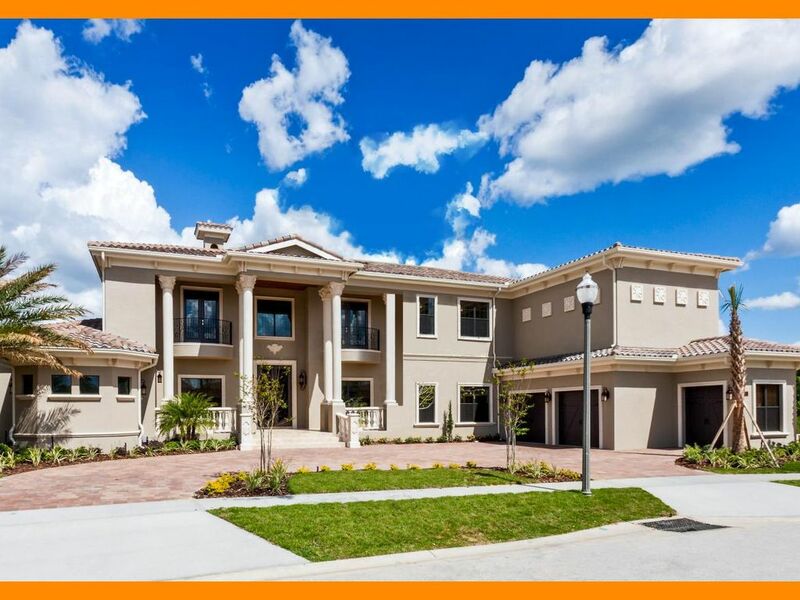 Top Villas is the number 1 vacation rental company for luxury Orlando vacation homes and condos. All of our homes are located within minutes of Disney and we only rent homes that are located in the best communities and Resorts. With our excellent customer service record, our price guarantee and stunning choice of homes you can start your vacation stress free knowing that you are booked into a Top Villa. 8 full stunning bathrooms 2 powder room with toilet and wash basins. Master Suite upstairs has a his and her's vanity and hot tub. Guest suite has a free standing tub. This vacation rental provides all the amenities needed for a fantastic vacation. It has a full equipped fitness suite, a cinema room, an elevator, library, a fully equipped kitchen for all season use, a summer kitchen for seasonal use which has a BBQ. There is also a large guest suite with the bed centered in the room, it has which has a sitting area, a free standing bath tub and a walk in closet. There is also a family room with a full size billiards table and lots of covered lanai's to relax in the Floridian sun. Great for large groups. Nice pool and pool area. Very nice property. Had plenty of room to accommodate a party with 11 kids. Kitchen is well stocked with plenty of dishes. We did have a problem with the spa heater. Contacted the managers and it was promptly fixed. No complaints there. The outdoor kitchen is out of commission from a previous occupant and an apparent fire. This was our only disappointment, wish this had been communicated to us prior to arrival as we had planned our meals around it’s use. Overall, a great experience. Easy check in. Nice house. Responsive management. Thank you very much for your kind review, we are so pleased to hear such lovely feedback about Reunion Resort 1. I apologise regarding the issues with the spa heater though I'm glad to hear that this was promptly addressed by the on-site team. I am also sorry that you were not advised regarding the outdoor kitchen, we do hope to have this back in action very soon and will be sure to make upcoming guests aware of this to avoid any disappointment. We hope to welcome you back to one of our beautiful properties again very soon! Very nice! It needed more garbage bags and dishwasher detergent but was an awesome house! Wow! What a week it was. Everyone was blown away as soon as they stepped inside this beautiful house. Amazing pool, movie room, Spa, steam room, gorgeous Master bed room with unique shower. Each room was well maintained with decor and furniture.Whole house music system and much more. This vacation at Reunion and at this house has spoiled all of us. This is our 3rd stay on the Reunion Resort properties and this was by far the BEST! This 9-bedroom home housed our group of 18 with room to spare. This home has all the bells & whistles, the technology package is out of this world! Everyone is our group was pleased with their private en-suite rooms, never did we feel crowed- in fact a couple of people got lost the first day, because of all the space. The kids loved the game & theater rooms, the adults loved the hot tub,sauna, and gym! The icing on the cake was the Grand Master Suite with over 11 shower heads in the master bath!!! We went to Orlando to enjoy some of the Theme parks as well, but honestly..NO one wanted to leave the house! The one day we did travel to the Theme Park, the kids wanted to leave the park early to get back to the house to go to the game room & pool. I would HIGHLY recommend this home, the owners & staff were very attentive and thought of everything. We WILL BE BACK!! If I could give six stars I would. Wonderfully equipped with exceptional good quality. Cannot praise highly enough - absolutely nothing negative to say. Great local management support too. Creatively routed on a sloping, roller coaster-like landscape, Arnold Palmer���s 6,916 yard, par 72 Signature Range vaunts intensive altitude changes ��������� up to 50 feet in some places – generating an exclusive assortment of risk/reward shots. That varied menu of shot-making opportunities is further guaranteed by six tee positions on each hole, a selection of instinctive sanctuary areas, liberally amp fairways and tactically placed bunkers across all 18 holes. Highlighted by rapid, rigid and vast progressing fairways, a selection of strategically placed bunkers and outsized greens, the 7,257 yard, par 72 Watson Course, a Signature Design by Tom Watson, is as much about tactic as it is about dimension. Demanding a well thought out approach from every player regardless of skill level, this course puts a premium on a solid short game with spacious green complexes where club selection can vary from putter to lob wedge to three-wood. This Parkland-style layout is smooth and flowing, with long horizon lines and elevated tee boxes and greens. Yet The Nicklaus Course, a Signature Design by Jack Nicklaus, can be as deceiving as it is picturesque. Formed to allure golfers into striking risky shots with theoretically great payoffs, the course tests the golfer to step up to the ball with a cautiously planned series of shots in mind.